WHILE many who call Bellambi home know of their historic watering hole by the railway station, some may be surprised to learn of their first pub, down by the sea. Today’s Bellambi Hotel – opened in February 1889 by South Bulli Colliery manager William Wilson – has remained a popular pub for over 120 years. However, way before the coal miners quenched their thirsts at the bar of the Bellambi Lane pub, another – by the same name – traded in what was the original Bellambi village. Bellambi Hotel opened in what became a jumbled collection of timber buildings consisting of a school of arts, a blacksmith shop and a harbour pilot’s cottage in 1861. The Empire newspaper reported in 1860 that the NSW Government had established moorings at the natural harbour to cater for vessels collecting coal from Thomas Hale’s new coal mine at nearby Woonona. The Empire reported in August 1861 that over 260 vessels over the past 12 months had been loaded with Bellambi coal from a jetty sprouting from the point where Bellambi pool is today. The pub was opened by 38-year-old Alfred Lorking on April 16 1861 to cater to the hard drinking merchant seamen, wharfies, miners and others etching a living from around the harbour. Along with farmers, Lorking had a ready supply of drinkers to keep him in a living. Married in Bath England in 1850, Alfred and Emma Lorking were unlikely publicans. Alfred was a jeweler before the couple migrated to the colony of NSW in 1851. Prior to ‘pulling’ beers at Bellambi, he worked at Thomas Hale’s jewelry shop in Sydney. Lorking eventually bought the business from his boss in 1853, and became well-known for his excellent craftsmanship as a gold and silversmith. Today his jewellery is in the collection of Sydney’s Powerhouse Museum, which describes Lorking as active in the trade from 1853 to 1859 at his George Street shop. His high-quality jewellery was often commissioned by Masons and some of Sydney’s wealthier inhabitants. The Lorkings were more than likely persuaded to head south to Illawarra by his former boss, Hale, who had established the Woonona Colliery and his father-in-law, Henry Fry, who had opened a post office and general store at Woonona. Lorking’s inn was a single storey timber building on the Bellambi Village Reserve – a parcel of land purchased by Hale in 1858 behind the sand dunes and fronting the harbour between what is today Bellambi Point and Bellambi Pool. Lorking was granted approval to open the inn on condition he built suitable horse stables. The Lorkings brought with them to Bellambi their four children, Sydney, 9, Emma, 7, Claudius, 5 and Florina, 3. Bar business improved for Lorking when another colliery joined Hale’s Woonona pit in August 1861. The Bellambi Colliery brought with it more miners and sailors to his pub. In an Illawarra Mercury story titled, Early Illawarra, on June 7 1940, Mrs M D’Arcy recalled some of the history of the area. D’Arcy was the wife Laurence, who together hosted the Railway Hotel near BulliPublic School during the 1890s and early 1900s. She was also the daughter of Michael Cawley, a Bellambi pioneer. …Mrs D’Arcy said that the present South Bulli mine was first opened in 1861 under the name of the Russell Vale mine by two contractors, Messrs Walker and Taylor. The coal was shipped from the old Bellambi jetty and Michael Cawley and Andy Lysaght had the contract for carting the coal to the jetty in bullock teams. Later when the line was placed down the coal was drawn by horses along the line. At that time Bellambi township comprised a hotel, blacksmith shop, school of arts, but no post office. The mails were received once a week and they came overland (to Woonona). 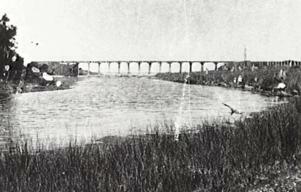 The town was situated at the jetty. 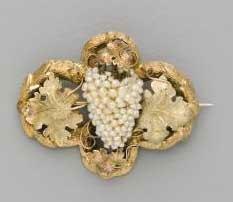 One of Lorking’s brooches kept at the Powerhouse Museum in Sydney. Not surprisingly, records show the hard drinking miners and seamen frequenting Bellambi pub were partial to rum and sherry. Tooth and Company brewery records show that Lorking purchased rum and sherry to the value of £55 and four shillings in September 1861. Lorking had the only licensed pub in the Bulli district at this time and his business flourished. The closest legal pub was Andrew Lysaght’s Fairy Meadow Hotel to the south (WhereWollongongHigh School is today), and in the other direction, on the road to Sydney at Appin. Between the first and second innings the players adjourned to Mr Lorking’s hotel where they did ample justice to the first rate fare set before them. In fact on both occasions in which Mr Lorking has catered for the cricketers he has succeeded in giving the greatest satisfaction. Around this time there was an unsuccessful push from the business community to improve Bellambi harbour by having a breakwater constructed. A meeting of over 200 people gathered in a hastily erected marquee near the pub in June 1862 to express their want for a safer harbour. The pub surely did a healthy trade on the day. The sickness of their fifth child – born at the pub in August 1861 – forced the Lorkings to move back to Sydney around this time. Eugienie later died at the Lorkings’ Hunter-street home on November 9 1862 at the age of 15 months. The Lorkings’ link with the Illawarra ends here, with Alfred later described as a “ship owner” living in George StreetSydney in 1866. He died in March 1883 aged 60, while his widower Emma died in 1916 aged 93. After the Lorking’s departure from Bellambi, the inn’s goodwill and lease was sold to David Hughes, who also took over the license. Hughes continued the tradition of sponsoring local cricket with the Illawarra Express reporting on November 8 1862 that the winner of a match between Bulli and Bellambi would receive a bat and ball donated by the new publican. The Express had reported earlier on September 30 that Wollongong Cricket Club was formed at the Royal Hotel Wollongong, enabling teams from Bulli, ‘Illawarra’, Campbelltown, Fairy Meadow and Bellambi, to play in a regional competition. Tooth and Company records show Hughes bought ale, rum, port, cordials and gin to the value of £108, 10 shillings and 6 pence in November 1862. Hughes more than likely had some important guests, or was preparing for Christmas festivities when he purchased 12 bottles of champagne from Tooth’s brewery in December 1862. Records show the champagne was valued at £2 and 6 shillings. Hughes’ monopoly on the pub trade in the Bulli area came to an end in April 1863 when two pubs were licensed nearby. The Woonona Hotel (on the corner of Gray Street and the Princes Highway) and Bulli Royal Hotel (near the corner of Hillcrest Avenue and the Princes Highway Woonona) began business two months prior to the opening of the Bulli Colliery in anticipation of the arrival of miners and their families. Hughes put the Bellambi pub up for lease on 1 May 1863, stating in his Illawarra Mercury advertisement that it was in full trade, had 16 rooms, “detached kitchen, stables, garden, and all convenient out-houses necessary for an extensive hotel business”. Hughes advertised “moderate rent” and “immediate possession”. During September Hughes’ pub was again in the Illawarra Mercury – this time he was advertising the sale of the freehold. Joel Henry Asher of Newcastle took-over the license of the seaside inn during August 1864 when he purchased its freehold. However, Asher’s new business venture was about to go terribly wrong. An over-production of coal caused a depression in the market and many mines were forced to close – including those operating at Woonona and Russell Vale. In September 1864, Taylor and Walker, owners of the Russell Vale mine, went insolvent and closed their colliery and Bellambi port operations. Hale’s Woonona mine had closed earlier in the year. The two collieries were the life blood of Bellambi harbour village, and their closure immediately had an effect on trade at Asher’s inn. The death knell came for the Bellambi inn when the Bulli Colliery opened in June 1863. As a result the population drifted northward towards Bulli, causing Bellambi and Woonona villages to stagnate as business centres for the next 30 years. Bellambi never recovered as a retail centre, until the arrival of the railway in 1887, when a village developed around the station and Wilson’s new South Bulli and Bellambi Hotel. Meanwhile John Biggar received instructions from the mortgagee to sell by public auction the lease, license, and goodwill of the old Bellambi Hotel at the harbour, together with stock, spirit, ale, beer, bar fittings, implements of trade, and furniture on February 19 1864. Despite the lack of trade, Asher struggled on, but the writing was on the wall and the pub closed midway through 1864. A never-say-die Asher gave Bellambi pub another shot, and advertised that he had re-opened his business in November. The same month he also advertised the pub to let again with “immediate possession, with or without furniture and stock”. However, the pub’s fate had been sealed with the closure of the two collieries and the departure of the merchant seaman from a now sleepy port. Bellambi’s seaside inn though was not to go without controversy. The Illawarra Mercury reported on November 8 1864 that Captain Porter of the vessel Corio met with a serious accident by a fall from his horse and was taken to Bellambi harbour’s pilot keeper’s cottage. The Illawarra Mercury reported that “it was considered prudent to remove him” from Mr De Flon’s cottage to Asher’s pub. On an application being made, however, Mr Asher, stated that he had no room as the whole house was occupied by his own family. Dr Lambert wished to know whether a publican had a right to refuse admission to a person in the position of Mr [Captain] Porter. The Bench thought not, but as the matter had been brought before them they would see that the police took action in the matter. Asher responded through the press in a letter to the editor of the Mercury on November 15 defending his actions. He said that there was simply no room at the pub and he and his family were “about leaving the house, and was packing up for that purpose”. He wrote Porter was already comfortably in a bed in the Pilot’s cottage and there was no need to move him. Asher, as he explained in his Mercury letter, was in the process of shifting house, and establishing a new business at Wollongong’s Market Square. He re-opened the former Freemason’s Hall Hotel, over-looking a much busier WollongongHarbour, as a guest house in December 1864. By Christmas 1864, Bellambi Hotel was no more. And with its demise the seaside village quickly followed.